Part of the fun of writing a book is designing your layout. We know we want to write about entitlements and taxes, for example, but how do you make that a compelling narrative? I’ve had this problem when explaining what my forthcoming book is about. The title is Bleeding Talent (to be published by Palgrave officially on December 11, 2012, but I am telling people it is 12.12.12 because that just sounds so much better), and I find myself tongue-tied describing the book in a way that might actually increase sales. “It’s about military personnel economics” doesn’t seem to get people nearly as excited as they should be. Yawn. I also found a line by Neal Stephenson that is just fantastic — won’t reveal it here, but it is not the one about the four things Americans will still be good at in the next century. 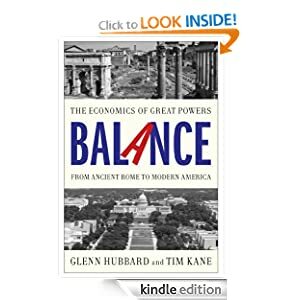 I am curious what great quotes you would recommend for a book about economic imbalance? How about this one? I thought is was apt given the title of your blog is Balance. “O who can stand? O who hath caused this?